Tim Bradley was known as the happy and outgoing guy who always seemed to be around for the biggest and best occasions in life. 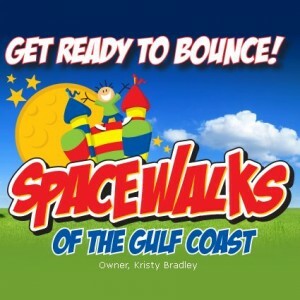 His business, Spacewalks of the Gulf Coast, was so named for the bounce houses popular at kids’ parties and festivals. But, Tim also rented tables, chairs and tents for weddings, reunions and other occasions. Up until his death from leukemia three years ago, he took pleasure being a small, but integral, part of the happiness of thousands of Coast families. Tim’s wife, Kristy Bradley Necaise, has remarried, but she and the entire family are committed to keeping Tim’s memory alive through the business he loved so well. “It was his dream and one of the last things he told us was ‘please take care of my business,’” she said. Kristy, who had been an elementary teacher and was not heavily involved in the business before her husband’s abrupt illness, took over with immense support from Tim’s parents and brothers. She recently renamed the business Bradley’s Waterslides & Inflatables of Gulfport both to honor Tim and the Bradley family and because inflatable water slides have become a huge part of the business in the last few years. “Tim put his heart and soul into the business,” said Kristy. She still lives on the property she and Tim shared adjacent to his parents and other Bradleys. The business is a part of all their lives. The guys help maintain and set up the rentals and her mother-in-law is in charge of the ponies. It’s a dream environment for Tim and Kristy’s son Timothy “Cole” who just turned four and also for Kristy’s new daughter, Ainsley. Tim’s daughter RaeLeigh is 15 and visits often. She said the adventure part was getting to know all about business. 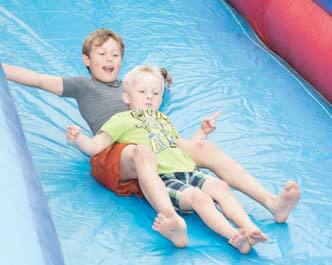 In addition to dozens of inflatables, tents, seating and ponies, the company rents sno cone, cotton candy and popcorn machines as well as other party supplies and interactives. Posted in: South Mississippi Living.